Tasmania’s southwest is one of the world’s wildest spots, a sparsely inhabited jumble of rugged mountain ranges, ancient trees, wild rivers and great swathes of national parks. The Tasmanian Wilderness World Heritage Area protects one of the last true wilderness regions on earth and encompasses a greater range of natural and cultural experiences than any other region on the planet.Drive from Hobart to Strahan and find yourself variously skirting open paddocks and farmlands, historic villages of convict-built stone houses or following the course of a twisting, shallow river or dense, lush rainforest. Then, just a few hours down the road, you’re winding through rarified alpine wilderness with snow-dusted mountain ranges looming above you, and by sunset you’re on a beach watching the sun sink into a pearl pink sea. Take a ride on the West Coast Wilderness Railway, an historic 35km daily journey of tight curves and spectacular bridges through dense rainforest. Go underground on a Queenstown mine tour. Take an exhilarating 50min jet boat ride through the heavily forested gorges of the King River. 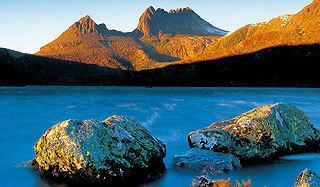 Wander the shoreline of Lake St Clair, or tackle the 80km Overland Trek to Cradle Mountain. Climb the dunes and watch the sun set at Ocean Beach near Strahan, Tasmania’s longest at 30km. Thousands of shearwaters (mutton birds) breed here during summer and provide an amazing spectacle each night at dusk as they return from their feeding forays over the ocean. Make a pitstop at gorgeous Derwent Bridge, midway between Hobart and Strahan. The Derwent Bridge Hotel offers old school pub food at last century’s prices, and at the nearby Wall in the Wilderness Gallery, internationally acclaimed local artist Greg Duncan is carving a visual history of Tasmania into three-metre high slabs of Huon Pine. You won’t believe your eyes. Spend an afternoon by the fire with a bowl of soup in Strahan’s Hamers Hotel and watch the fishing boats, laden with craypots, dock at the wharf. Strahan Colonial Cottages. Reid Street, Strahan.